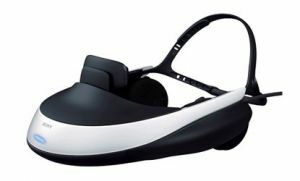 Back in CES 2011 Sony showed a prototype Head Mounted Display (HMD) featuring two 1280x720 OLED microdisplays. It was just a prototype back then, and now Sony announed that they will release the HMD (called HMZ-T1) in November (in Japan at first) for ¥60,000 (about $780). Sony uses Dual Panel 3D technology which utilizes separate panels for the left and right eyes, each with its own dedicated 3D video. These Sony-made OLED microdisplays are 0.7" in size each and use the same technology as Sony's recently announced 0.5" microdisplays.